She Stood for Freedom: The Untold Story of a Civil Rights Hero by Loki Mulholland is a unique story explores the life of Joan Trumpauer Mulholland; an ordinary girl from the South who just did the right thing. The Civil Rights Movement was an extremely tragic yet absolutely necessary piece of American history. Both black and white people made great strides in human rights and equality in our country. Many people seem to forget that African Americans were not the only people standing up for equality. White, Indian, Asian–people of every heritage were standing together. Joan Mulholland was one of these people. Raised in Virginia, she grew up with segregation and harsh racism. She grew up being taught that mixing races was wrong. But despite all this chatter in her ear, Joan knew that this was wrong. She took a stand when she began college, joining peaceful movements, sit ins, protests, and other demonstrations. She was kicked out of Duke University for her involvement with the Civil Rights Movement. Despite the backlash and threats that she received, Joan never gave up on her belief that what she and the rest of her friends were doing was the right thing. She was one of the first white students to attend an historically black college and join a black sorority. Her life was almost always at risk; she lost many friends and family; she lived in jail for several months of her life. All because she was doing the right thing. And the rest of culture couldn’t accept this. She was an average hero. She Stood for Freedom is extremely timely in its release. With all of the turmoil in our society right now, this book reminds us that we are all working together for a common goal. We’re all humans, and it’s high time that we remember that. Our world needs to be changed? Then let’s do it together, with our friends, one step at a time. Grab your copy of this amazing book HERE or click on the book image above to take a closer look. 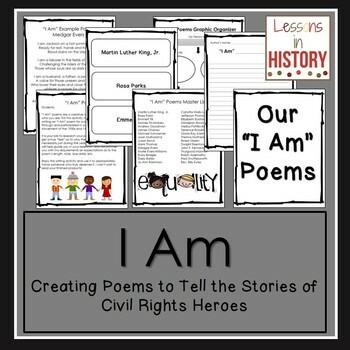 Research a Civil Rights hero (Joan for example) and write a poem telling about their life.